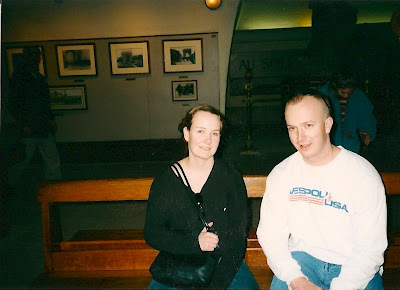 It's hard to believe, but my hubby and I celebrated our 10-year wedding anniversary this past April. I guess I find it hard to believe because we are relatively young (in our early 30's), and plenty of our friends and acquaintances are just now getting married themselves. We definitely felt a little odd at times on our recent Costa Rican vacation, surrounded by couples who had just gotten married literally days before. Many of them looked to be about our age, and some were even older! When people asked if we were on our honeymoon, we usually replied, "Um, sorta...like our second honeymoon." When we told them we were celebrating our 10-year anniversary, we got that kind of wide-eyed look, something that implied, "Ohhhhh...riiiight." Like there was a certain "reason" we got married so young. Not true - we're just kind of old-fashioned that way! We met in college, dated for 3 years, and got married when we were 22 and 23. How very Bella and Edward of us! My hubby was a Second Lieutenant in the US Army when we got married. He was stationed in Kitzingen, a town in the German state of Bavaria. During our engagement, he lived and worked in Germany, while I lived and worked back here in Rhode Island. It was a tough arrangement, to say the least. We got engaged in July and were married the following April, and during those 9 months, we saw each other for a total of about two weeks! 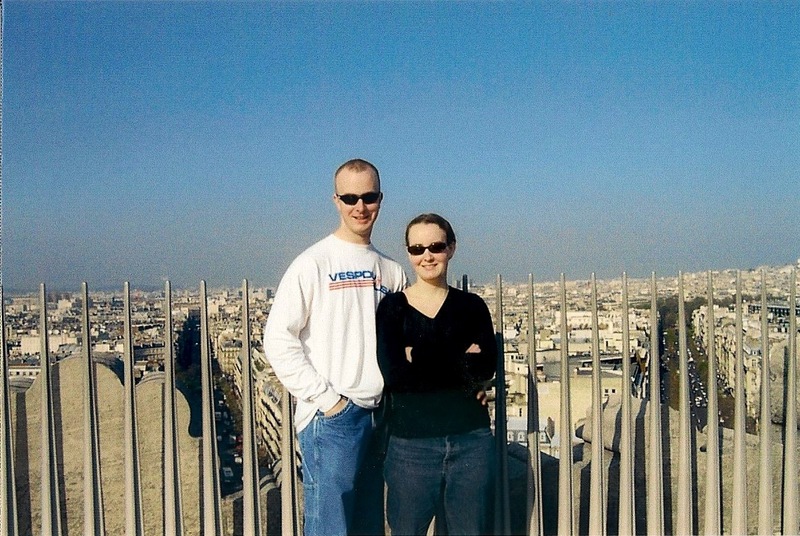 My hubby flew home 5 days before the wedding, and just 3 days after our "I do's", we were on a plane to Paris for our honeymoon. 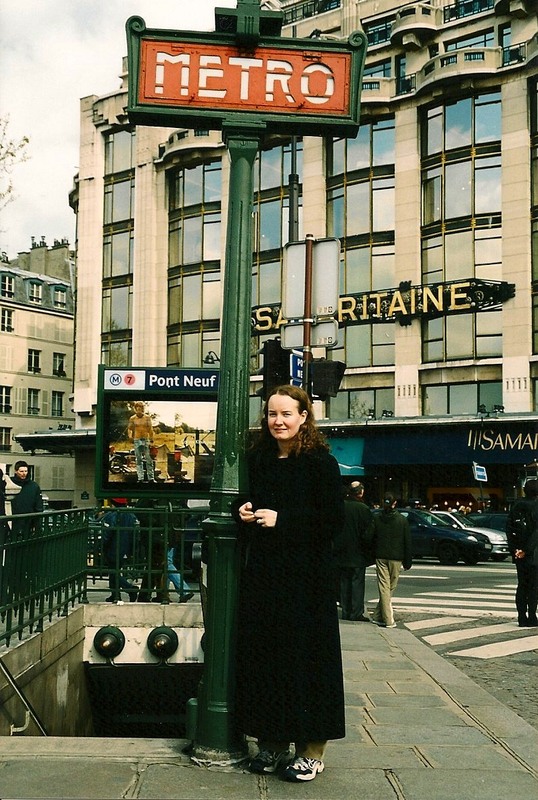 It was a short stay in the City of Lights (4 nights), since we were exhausted (me), jet-lagged (both of us), and not exactly rolling in the dough (again, both of us). 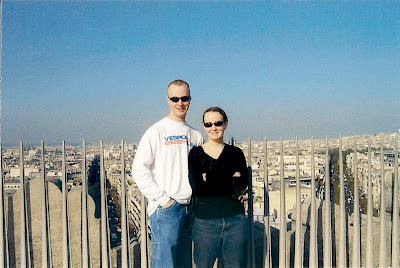 But whatever our honeymoon lacked in time, it more than made up for in sheer romance :) I mean, it's Paris! ...don't let the weather ruin your trip. You may have imagined April in Paris as being lovely and warm, with bright beautiful flowers everywhere and butterflies all around. 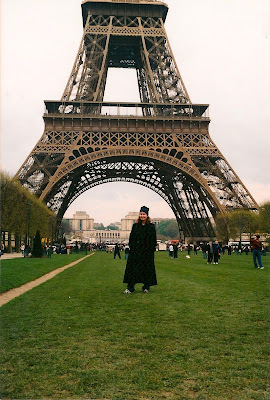 However, you just might be stuck with honeymoon photos of you wearing a ridiculous fleece hat and a long winter coat, because it's freezing cold and drizzly. ...don't let your wife (!!!) (or husband) walk around fashionable Paris in Adidas trail shoes. Bad idea. Bad. The Parisians will not be pleased. ...do spend some time just sitting on the Champs-Elysees. Because you're exhausted, jet-lagged, and too poor to do anything that costs money. ...do not attempt to walk up the inside of the Arc de Triomphe on an empty stomach, or on an even slightly unsettled stomach. See those weak attempt at smiles? We're actually about to toss our cookies after walking up the most ridiculously tight spiral staircases ever built. ...do press on despite your nausea, because you get the most incredible view of Paris from the top of the Arc de Triomphe! Just don't impale yourself on one of those giant spikes. Yeesh. ...do cook some wonderful French-inspired meals at home 10 years later, to erase the memories of the Pizza Hut, Haagen-Dazs, and McDonald's that you ate during your honeymoon in Paris. Le sigh. 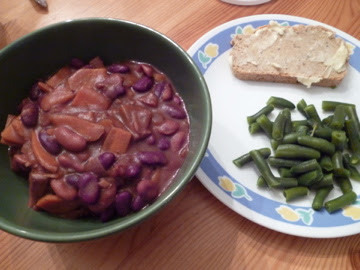 Tonight I made Beans Bourguignon and Quick Herb Bread, two recipes from 1,000 Vegan Recipes. 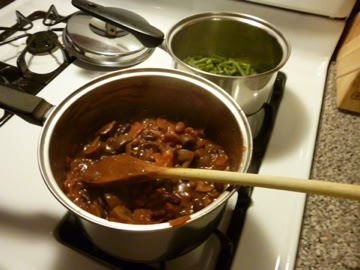 This stew was to-die-for-delicious and I felt like a true Julia Child making it. It smelled heavenly while it was cooking (1 cup of red wine will do that to a dish), and it was tummy-rubbing scrumptious. 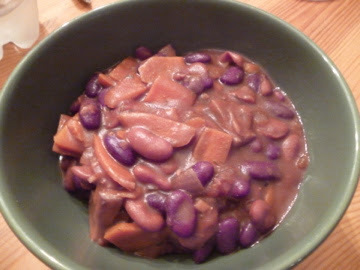 Woodsy mushrooms, kidney beans, carrots, garlic, shallots, tomatoes, and herbs are sauteed, simmered, and steeped in red wine. The stew is thickened by a vegan version of beurre manie, which made me feel super-French, even though it's just vegan margarine kneaded with flour. But doesn't buerre manie sound so much fancier? While the stew simmered, I cooked some green beans and baked the bread. 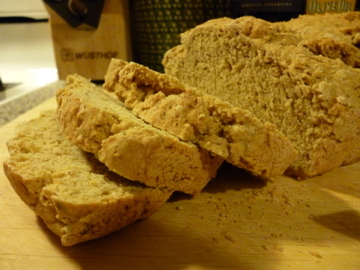 This simple, rustic loaf was made with white whole wheat flour, baking powder, dried herbs (basil, thyme, and marjoram), salt, pepper, soy milk, and olive oil. It had a great crust and was a fantastic accompaniment to the stew. Soooo much better than Le Royale with Cheese, n'est-ce pas? I wish you had Smell-o-Vision so you could tell how wonderful this was. But you don't. So just take my word for it. 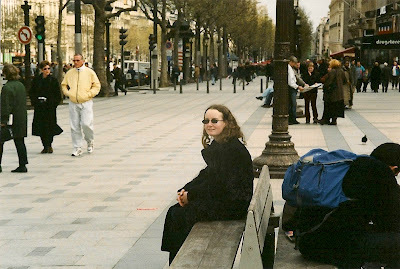 I have more pics (and tales) of Paris, which I will get to in a later post. For now...au revoir, mes petits amis! Oh la la ma cherie! J'aime Paris! Mes yeux sont verts avec envie! 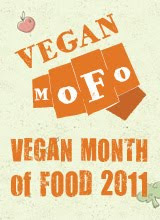 And your food looks fantastique too!! Will there be Paris part 2? Bon Appétit! Happy belated ten years! :) I love the old photos. And I honestly think that adversity makes for the best memories! Hi Kelly! Thanks for your nice comments! :) I completely agree with you - some things are unpleasant at the time, but you can usually look back and laugh at them! !